Rose Hill Plantation is located in the Low Country of South Carolina in the greater Bluffton area of Beaufort County. At Rose Hill Plantation, you will find a variety of lifestyles and homesites that includes large golf fairway homesites, country estates of 2.5 to 4 acres, and oversized marsh waterfront homesites with views extending to the Colleton River. 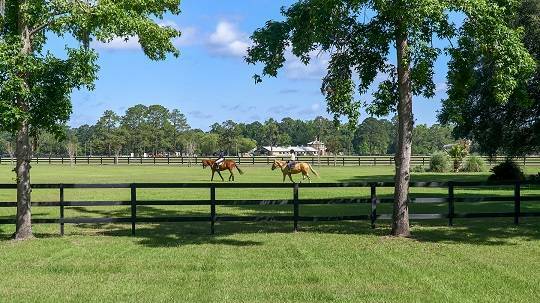 Over 2,000 acres include 18 holes of golf , docks for fishing and boating on the Colleton River, tennis centers, pools, recreation parks, and a complete equestrian center with 50 acres of pasture and 17 miles of greenbelt riding and hiking trails. South Side residents enjoy luxurious views provided by an 18-hole golf course laced with ponds and lagoons and Magnolia trees, creating a low country paradise that is home to alligators, deer, exotic water fowl and many other Southern flora and fauna. The North side offers a swimming pool, two Hardcourt tennis courts and the Colleton Point area with boat ramp, dock and meeting center, while the South side includes two swimming pools and two clay courts. There are approximately 17 miles of roads and paths in the Plantation and has a 24/7 security.